How many of your website visitors turn into customers? We will help make your e-commerce website your most effective selling tool. We have solutions to fit every budget and need. The first step to creating your own on-line store is deciding which products or services you will be selling. After this is defined, you can start envisioning your on-line storefront and picturing what kind of virtual atmoshpere you would like to create. If you already have a website, a simple option is to add a Shopping Cart to your existing site. If you do not have a website, we can help you build an entirely new e-commerce store from scratch. Either way, it is important during this visioning phase to consider how you will integrate other transactions with your e-commerce site. This includes deciding whether you want to process your phone, mail and fax orders through your website which may require additional features. Once your on-line store is built, you need it to function in a highly secure manner to process your sales transactions and collect customers’ payment and personal information. We will help you achieve this by using a combination of e-commerce tools including shopping carts, merchant accounts and Virtual Terminals. The Shopping Cart is the mechanism that allows customers to select and save items, then ultimately pay for them. There are a wide variety of products available that vary in price, function and security. We work with several carts regularly and will help you choose the one that best fits your store. If have already purchased a Shopping Cart, we can help you integrate that into your new store. Once your Shopping Cart is set up, in order to process and receive customer funds, you need a payment gateway to handle the authorizations and transactions as well as a merchant account to deposit the funds. Conveniently, many shopping cart services also offer payment gateway and merchant account services. If you already have a merchant account for your bricks and mortar store, you may also consider using this for your e-commerce endeavors. we generally recommend PayPal Pro due to low monthly and per transaction fees. Additionally, PayPal Pro has Virtual Terminal services available which allow you to accept credit card orders over the phone, by mail or fax, and then process them through your computer. PayPal Pro also gives you the ability to deposit funds directly into your checking account daily (AutoSweep) and does not require an additional payment gateway which is another benefit. Another payment processing option is Google checkout. Most commonly this is used for a merchant account, when the buyer is given a choice to be taken from your website to Google’s for checkout. To learn more about Google checkout click here. Checkout by Amazon is a complete checkout and payments service for e-commerce retailers. Amazon customers can use shipping addresses and payment information associated with their Amazon.com accounts to buy on your e-commerce or mobile website. 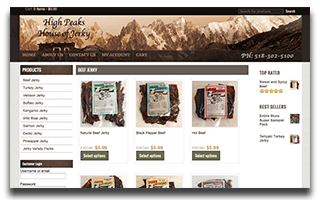 Customers complete purchases quickly and conveniently, without ever leaving your website. To learn more about Amazon checkout view this page. This is actually a payment gateway, and the most used gateway out there with many merchant accounts already tying in and easy capability for new accounts to link up. Authorize.net is typically the best choice for sites without an existing gateway because it integrates easily into many shopping cart platforms thus cutting back on development costs. Set clear goals for each page. Each page of your website should have a clear purpose. For example, your homepage’s goal is to entice users to click through to your categories, or better yet, straight through to a product. On a product page, your objective is to provide the user with all the information necessary to convince them to make a purchase and make it very simple and easy to add an item to the shopping cart. Your shopping cart page’s purpose is to initiate the first step of the checkout process by clicking on “Checkout”. Keep these general ideas in mind when planning out the various types of pages on your e-commerce website. Get repeat users. Find ways to get users to come back regularly. One way to accomplish this is to allow users to get notified when a sold-out item is back in stock. Look for opportunities to bring users back to your website wherever possible. Ideally, the more a visitor visits your website, the more likely they are to make a purchase. Have easy points of contact. Find ways to make it very simple and enticing for customers to contact you, thus putting you directly in touch with them. A few examples may be the ability to inquire about a product, to leave reviews, or to upload a photo of themselves using a product. Display contact information clearly. Make contact information clear and accessible to your customers so they can contact you if they have any questions. Don’t frustrate your customers by having them scour your entire site to find your contact information, or you could lose sales. Simplify the checkout process. Create a checkout process that makes it effortless for your visitors to purchase their products. For example, don’t ask unnecessary information from customers. It has been proven that the more fields there are in Web forms, the fewer people fill them out. Also, keep your pages in the checkout process clearly labeled and free of unneeded items. For example, visitors should be able to easily distinguish between a shipping form and a credit card form. Remember you’re not alone. Most people shop online by visiting many websites when searching for a particular product. They eventually narrow down their choices to just one. Whether your e-commerce website makes the cut will depend on many different factors. Watch your pricing. Make sure your pricing is not higher than your competitor’s for the same product(s). Be careful with your shipping costs. Shipping costs can gain you sales over other competitors, but it can also lose sales if you don’t make sure you compare real world shipping to calculated shipping costs and make needed changes over time. More sales are lost because of high shipping than any other step in e-commerce process. Amazon is great, but don’t try to be them. Rather than trying to sell everything, focus on a few niche products and grow from there. Hosting matters. Uptime and scalability is very important make sure your hosting plan is solid and can grow as you grow. This is one place you do not want to be skimpy. Security is important. Shopping online offers lots of benefits but many customers are still hesitant about buying online because of identity theft. If the customer has never bought from you in the past or does not know someone that has, you have a lot of convincing to gain their purchase. Do everything you can to keep the personal information of your customers safe. Include links to your privacy and return policies. Also be sure to display those trust symbols (i.e. VeriSign, Comodo & McAfee) proudly on your site, indicating your checkout process has been verified and is secure. Also make sure you check your cart often to look for any visible errors as these are often deterrents from purchase as well. Clean design. Make sure the design is as clutter-free as possible. There are most likely many elements you would like to put on every page of the website, but really think about what’s most important in convincing the customer to make a purchase. List all of your elements and decide which ones are vital to making a sale. Also prioritize information from most to least important. For example, on a product page, the image of the product, title, description, availability, price, etc. are obviously important. Keep this in mind throughout all pages of the website and avoid overwhelming visitors with too much information within a small area. Visible shopping cart. Design a shopping cart that remains visible throughout the site. With high cart visibility, users are re-assured of what exactly they have in their cart and how much it costs. This also makes it easy for them to quickly check out. Clear navigation paths. Give users a clear idea of where they are within your website structure. Breadcrumb links are a good strategy as well as having drop-down menus which demonstrate the structure of the website. Strong calls-to-action. Each page requiring action by the user, such as a product detail page, should have a strong call-to-action inciting the user to take the next step toward accomplishing the goal of the page. This may be “Add to Cart”, “Checkout”, or most importantly, “Submit Payment”. Be sure to not have more than one prominent call-to-action (i.e. “primary call-to-action”) per page. Secondary calls-to-action are good to have when a user is not quite ready to commit to the primary call-to-action. For example, they may be willing to view your software demo, but not ready to purchase your software. Rather than lose that visitor, keep them on your website for a few more minutes by offering them secondary options. Intuitiveness. In any website design, it should be crystal clear to your customers what is going to happen when they click on something. How to go about accomplishing their objectives on the website should also be clear to the customer. Use on-hover techniques to keep your design clean, yet explanatory regarding what is going to happen when they click. Label links in a clear way to help the user know what to expect on that page. Give your customers an experience that is pleasant, without surprises. Look at major e-commerce websites, and borrow techniques that seem consistent across many of them for a safe bet. Major website companies test their designs over and over again to find what generates the best results. Some of their techniques can be borrowed for your website. Consistency. Whether it’s your colors, your layout, or style guidelines, keep a consistent image across your website to avoid confusing your visitors. If you have a variety of colors being used for the same type of button, it may cause a drop-off in sales simply due to the uncertainty brought on by the inconsistency of your design. Easy checkout. Create a checkout process that is as simple as can be. Fields should be easy to fill out, not too close to each other. Pages should be clearly labeled and free of clutter. Look at some of the world’s most popular websites for ideas on what a good checkout process might look like. Featured promotions. Highlight certain promotions, usually seasonal, which can push traffic to specific parts of your website. Search and auto-complete. Give users the flexibility of searching for products that they are interested in. If the search bar suggests results, that will help you sell more by sending traffic to those specific products or categories rather than displaying a general search results page. Sorting, filtering, and viewing all. Allow your customers to customize their e-commerce experience. Give them the ability to arrange your category pages as they please; to sort using various criteria like prices, popularity, a-z, etc. Also provide filters where necessary. Many customers do not enjoy clicking through pages of products and having a “View All” option is a good idea. Quick preview. For fear of having to wait for another page to load, many customers may not want to click through to view your product pages. Instead, using a quick preview on category pages will provide them with the information they need to decide if they want the product without having to click through to the product page. Just like having secondary calls-to-action, a quick preview option gives users a secondary choice when browsing your website. Related products. When a customer visits a particular product page, he or she demonstrates an interest in that type of product. Why not show them other products that either compliment the product being looked at or solve similar problems? This type of feature can keep users on your website for longer and increase the amount of money that each customer spends. Share features. Give your customers quick and easy ways to share your product pages with friends and colleagues. Although it is very easy to do this manually, it increases the chances that someone will share a product with a friend if there is an easy-to-use button to do so. Out of stock. Just because some products, sizes, or colors go out of stock, does not mean that your customers should have no options. When such an event occurs, allow customers to sign-up to be notified when the product size and color they desired is back in stock. That way they are less likely to go to a competitor, and it shows that you care about serving their needs. Product details. Extensive product details can make the difference between almost making a sale and an actual sale. If a customer cannot find all the information they are looking for regarding a product, they may feel too uncertain about completing their purchase. It is very important to provide all of the information that you have on your products in a clean, concise manner. Dynamic shopping cart. When a visitor adds an item to your shopping cart, rather than taking them straight to the shopping cart, display your shopping cart on the page in a small window that dynamically populates with the product(s) the customer is adding. This way the user experience is smooth and the customer is assured that their products have been added to the cart. Save for later. Many visitors may add a number of items to their shopping cart without having the intention of actually completing their purchase. Rather than forcing your customers to make the black and white choice of deleting a product from the cart or buying it, allow them instead to save it for later. Shipping cost calculator. Allow customers to calculate the shipping costs directly from your shopping cart before going through the checkout process. The purpose of this is to avoid having users who leave due to the uncertainty they face going into the checkout process. Since the checkout process is a significant investment of time and effort, many would rather not start the process than find out halfway through that your shipping costs are too high. Instead, give them the ability to find out upfront, to avoid disappointment later. This may also give them the chance to go back and change some of the items in their cart or save them for later. Shipping options. This is a huge item and can make or brake an e-commerce website. Do not use a flat rate or a single rate for shipping. Different customers will want different shipping methods; some will want their products to arrive immediately and others are fine with paying less for slower shipping. Cater to all types of clients to avoid a drop-off in sales due to shipping options. Payment confirmation. Clicking the final “Submit Payment” button for many customers can be a stressful moment. Calm their nerves by not only displaying a payment confirmation page, but also sending an email confirming reception of their payment and containing next steps that they should expect. Order tracking. Once an order has shipped, provide your customers with tracking information so they can feel at ease during the shipment of their order. Dashboard. As the administrator of your website, you should have a place where you can review all pertinent information regarding the performance of your website. The dashboard should be customizable and offer summary information regarding various aspects of the website: out of stock items, information requests, sales figures, and ecommerce performance metrics. Administrator management. You may have a team to work on your website, which means you should be able to give each team member a certain amount of administrative control. You should be able to decide what sections of your CMS each team member can edit or view. META data control. Ability to control your meta data is crucial when trying to get your website to rank well for various relevant keywords in search engines. You should be able to customize the title tag of every page on your website as well as easily create rules for types of pages to handle title tag creation. For example, you would not want to have to write the page title of each and every product on your website, especially if you have thousands of products. Instead, creating rules for each product will help you optimize a large number of product pages all at once. Crawler control. A robots.txt file allows you to limit what content search engine crawlers get access to. Your content management system should allow you to upload a robots.txt and also be able to edit it if need be. Sitemap. A sitemap.xml file tells search engines of all the pages on your website, to ensure that those pages get crawled. Tracking code addition and editing. Whether it’s your Google Analytics code or Google Website Optimizer, you should have the ability to easily add and update tracking code on various pages. This will compress testing timelines by skipping the need for a web developer each time work is required. Store management. Each of your categories, subcategories, and products should be easily editable through your ecommerce back-end. That includes updating of product colors, sizes, descriptions, etc. and the ability to specify which categories/subcategories to feature on the home page or menu. Order management. Whether you have integrated with a 3rd party system or not, you should have a comprehensive understanding of the status of sales on the website, shipping orders, and customer information.